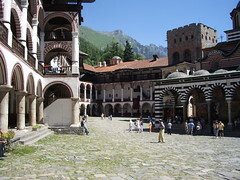 Prime tourist and religious site of Bulgaria, the Rila Monastery is a unique place whose history is linked to the preservation of Bulgarian culture. Located 120 kilometers south of Sofia, the Rila Monastery rises to 1147 meters in the heart of a narrow valley of the Rila mountain in south-western Bulgaria. Despite the turbulent past of the country and which suffered much destruction, the Rila Monastery has emerged over the centuries as the guardian of Bulgarian culture, oppressed for a long period by the Ottoman occupation (1400-1878). A symbol of the Bulgarian Renaissance in the nineteenth century, it is visited annually by thousands of pilgrims from Bulgaria and the Balkan region. The majority of tourists in Bulgaria visit this monument, the pride of an entire people, and it is therefore natural that the Monastery of Rila ranks as the first site to be visited in the country. 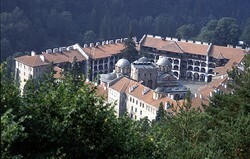 The Rila Monastery was founded in the tenth century by Ivan Rilski (St. John of Rila). The hermit lived in a cave located three miles northeast of the current location of the monastery. Gradually, a community of monks gathered around Ivan Rilski and so they built the first buildings of the monastery. These were however destroyed by fire in the thirteenth century, but with the help of a powerful local prince, new buildings were constructed within few kilometers of the first monastery. Bulgarian tsars largely contributed to the development of the monastery into a major religious and cultural center of Bulgaria, which reached its zenith between the twelfth and fourteenth century. Destroyed and looted in the early fifteenth century by the Turkish forces then occupying the territory, the monastery was rebuilt from 1469 when the saint's relics were brought there. The Rila Monastery became for centuries the symbol of Bulgarian identity against the Ottoman occupation. It also became an important pilgrimage center in the entire Balkan region. In 1833 a fire destroyed much of the monastery. A major mobilization was organized in the country then: donations, and even artisans, flocking to help in the reconstruction of the buildings. The vast majority of the current architecture dates from this period, with the exception of the tower Hrelyu dating from the fourteenth century. The Rila Monastery was declared a National Monument by the Bulgarian government in 1976 and added to the list of World Heritage by UNESCO in 1983. For Unesco, "this characteristic monument of the Bulgarian Renaissance (XVIII-XIX centuries) symbolizes the awareness of a Slavic cultural identity following centuries of occupation" (Source: World Heritage Convention of UNESCO ). The Churchof Our Ladyof the Assumption, located in the center of the courtyard, is the largest monastic church in Bulgaria. Surmounted by five domes, it contains three altars, two chapels and a beautiful carved wooden iconostasis. More than 1200 murals, created by leading Bulgarian masters in the field, adorn two entrances to the monastery, the walls of the main church and those of the chapel tower Hrelyu. Access to the monastery is free, but you will need to pay for admission if you want to visit the museum. For visitors with more than one day to tour the site, it is possible to spend the night in one of the cells of the monastery and take trips on foot in the forests and mountains. Visiting the museum is worth it. It houses the Cross of Raphael, a true work of art created by a monk for nearly 12 years. It was carved from one piece of wood and using magnifying glasses, 104 religious scenes and 650 miniature figures. The legend says that he lost his sight after his masterpiece was completed. For those seeking a unique experience, some monks' cells are converted into accommodation for tourists. The comfort is basic, and the number of cells to external visitors is limited, it is advisable to book your arrival on site. Spend the night in the monastery to discover the monument from a different angle and more time enjoying the tranquility when groups of tourists are gone. It is possible to eat in restaurants located a few meters from the entrance of the monastery (Samokov gate). But beware, the monastery doors are closed between 22h and 6h in the morning. The Rila mountain range is a paradise for hikers. Paths can reach the highest peaks of the region. For fans of walks, a path from the monastery can reach the hermitage St. Luke (nephew of Saint John of Rila) and the cave where St. John lived and where Ivan Rilski was buried for the first time. Sounds like an amazing place to go on pilgrimage! I'd love to see it. What types of icons are there?